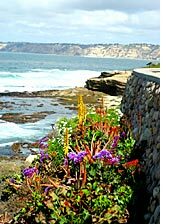 Article - Touring San Diego: La Jolla California | La Jolla will take your breath away. The Crown Jewel of San Diego. If Coronado is the “crown” of San Diego, La Jolla is the crown jewel. The word La Jolla means “The Jewel” in Spanish. This gold coast town lives up to its name. In a city where tract homes often start at $800,000, homes in La Jolla command millions of dollars. 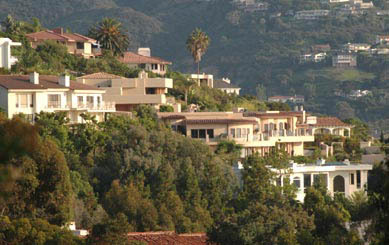 This is the land of the rich and famous who live in mansions nestled into the hills above the Pacific Ocean. Lodging in La Jolla ranges from the stunning boutique hotel such as La Valencia in the heart of town, The Sea Lodge located steps away from La Jolla Shores, or chain hotels on the scenic Torrey Pines Road. As one might expect, dining in La Jolla is a culinary delight with offerings from award winning steaks at Donovan’s to crabs at the Crab Catcher. Don’t miss the Marine Room located on the beach where crashing waves pound against the large picture window. Prospect Street is where you’ll find shops, restaurants, high end hair salons, art galleries and more. When touring the town of La Jolla be sure to stop by the Cave Store. Here you’ll pay a small admission to take a step staircase down into the bluffs through a narrow tunnel. The tunnel opens up to reveal a fabulous ocean cave. The beaches of La Jolla can’t be beat and are unique in their own right. Windansea is a well known “locals only” surf break, La Jolla Shores has a vast stretch of white sand and a green grassy area, Black’s beach is clothing optional, La Jolla Cove is a premier diving and snorkeling spot, the Children’s Pool is a small gentle cove that is often overrun with sea lions, Marine Street Beach is scenic but sometimes rough, and Torrey Pines State Beach lies against sandstone cliffs complete with hang gliders soaring overhead. Wind your way up to Mt. Soledad for stunning 360 degree views of San Diego. The cross atop Mt. Soledad has been a source of controversy for over twenty years and may not remain much longer. It currently serves as a tribute to war veterans. located. On the bluffs above is where the Birch Aquarium can be found. 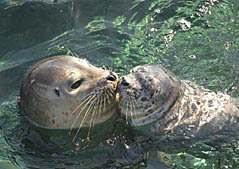 The aquarium is the public exploration area of the Institute of Oceanography. With ticket prices topping out at $11, this aquarium is a bargain and as beautiful as the setting surrounding it. In addition to the Scripps Institute, La Jolla is a hub for science. The Salk Institute makes its home here. The building, which won the American Institute for Architects Twenty-Five Year Award, is breathtaking and the work that takes place inside is cutting edge. Each year, the San Diego Symphony puts on a night under the stars at this fantastic facility. 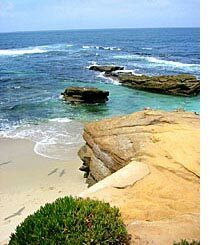 Offshore, the La Jolla Ecological Preserve covers the ocean from La Jolla Cove to La Jolla Shores. Here boat speed is limited to just 5mph. This is a famous spot for snorkeling and scuba diving amongst the kelp beds. The water visibility is the best in the region. Kayaking the preserve is popular too. No matter how you spend your time in the crown jewel of San Diego, a visit to La Jolla will take your breath away.